Getting here is the trick and the instructions are pretty much on. One item since the original instructions is the gate has been moved to just before the "circle." I found that the if the address is 1018 St. Mihiel Rd. 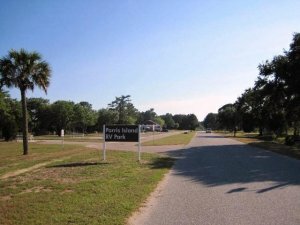 Port Royal, SC., that it will take me right to Bldg 1018 at the park, or pretty darn close by yards. However, my GPS wanted me to turn onto Saigon St. That is the old trailer park (wish they would turn it into an RV Park) and the roads are grown over, but it can be done. Instead, ignore the Saigon instructions and go to St Mihiel Rd just a little pass Saigon St and turn right. The so called RV Park signs are very small and crowded on the sign post with a bunch of other items. One would have to be going extremely slow to be able to read the sign. The key to getting to the RV Park is "Wake Blvd." Whether coming down 3rd Bn Pond road, or Malecon Dr, turn right on Wake Blvd. When you see the Wye bear to the left and proceed to Mihiel Rd. All sites are back-in. There is a slight hump to rise over when backing in so that one can get both sets of jacks on relatively level ground. RV Pad is gravel/crushed rock and there is a cement pad with picnic table and patio area. Patio side has the nice shade from the RV and Awnings during the afternoon. WiFi for me was very good. Anytime the computer goes to sleep one has to log on again, but not much of a problem. Depending on ones RV hooking up to sewer could be a challenge but only if you do not have enough sewer hose. I used a 15' and a 10' with the 10' only extended about 6-7 extra feet. A 5 foot extension would not have worked for me. The rating for location is a 4 only because everything is far away. I could not get the code to work for the bathroom but the general areas were clean and tidy. There are no amenities but it is still a good value for the money. We stayed here in a 43Ft Motorhome. The actual RV Park road runs parallel to the thoroughfare road and is very narrow and one-way. Longer RV's, 40' or more and maybe even 38Ft'ers. Making the turn onto the thoroughfare is very tight. This morning a 40'er without a TOAD connected had to back up to make the turn. My intention is to pull out against the one way and hook up that way. The transition then is much easier.